Battery powered leaf blowers have come a long way compared to gas-powered leaf blowers and corded electric blowers. Thanks to improved battery technology, they are strong enough for daily use. This site aims to provide a concise review of the best battery operated leaf blowers, or cordless leaf blowers on the market today. lighter than a gas leaf blower. Volts – more volts means more power and ability to produce more CFM. Weight – how heavy a leaf blower is may help you decide which one to buy. The heavier units will tire you out quicker. A higher MPH is not necessarily a better leaf blower. If the MPH is high and the CFM is low, the unit may be blowing air quickly (MPH), but the volume (CFM) is too low to move leaves. MPH should be at least 80 MPH. CFM is the best measure of how useful a leaf blower is. The higher the CFM, coupled with a decent MPH, will give you the best performance. Battery volts range from 18 to 80. The best performing leaf blowers are at least 40 Volts. Run-time is an important measure for cordless leaf blowers but it is difficult for manufacturers to offer a number due to many variables. Battery size, temperature, and the speed at which one runs the leaf blower, all contribute to the useful time between charges. However, we’ve managed to find run-time for most of the leaf blowers reviewed. Weight is also a difficult item for manufacturers to report if the unit has a variety of optional battery sizes. When possible, we will report this information. The GreenWorks leaf blower, model Pro GBL80300, uses the highest voltage system of any leaf blower we’ve reviewed. At 80 volts, the higher voltage helps assure higher power and run-time. The high speed and ample volume of air flow make moving leaves a breeze. 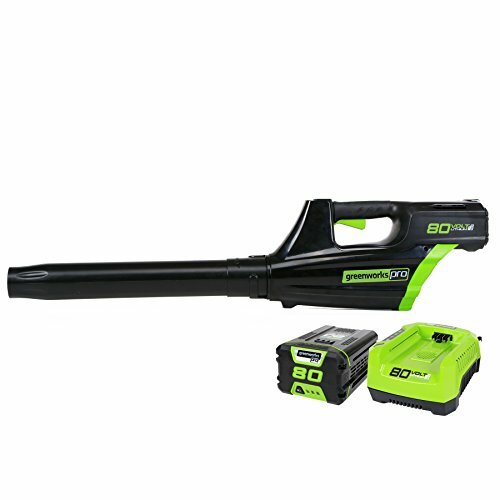 This Greenworks leaf blower kit comes with a 2Ah battery which can run for as much as 70 minutes. An optional 4.0 Ah battery is available. The GreenWorks Pro line of compatible equipment includes a lawn mower, hedge trimmer, 10-Inch pole saw, and string trimmer. Share battery with other GreenWorks yard tools. This unit received our highest rating of all the others. It has the highest CFM, one of the highest MPH, and the highest voltage system. It’s run-time was not the best, but almost. 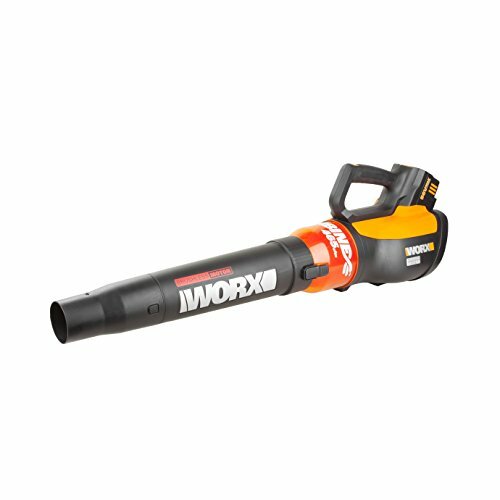 This Worx leaf blower, using a 56 volt battery, is a variable speed leaf blower with a “Turbo boost” speed to help dislodge challenging bits of leaves. A 2Ah battery is included with a rated run-time of 90 minutes. The battery is compatible with other 56 volt Worx yard working equipment such as a string trimmer and wheeled edger, 24″ hedge trimmer, and a lawnmower (2018 Update: lawnmower discontinued). No larger optional batteries are available. Shares battery with other Worx yard tools. Popular Mechanics gave this unit their top honor when reviewing 8 battery-powered leaf blowers. The Worx unit has the longest run-time of all the leaf blowers we reviewed. It has one of the highest MPH, but a slightly lower CFM than our top rated model. If a longer runtime is what you need, then this unit may be your best choice. The EGO Power+ 4801 ranks well in the top three with a high CFM. This Ego leaf blower has variable speeds. The battery is interchangeable with other EGO Power+ yard tools including a lawn mower, string trimmer, 24″ hedge trimmer, and a 14″ chainsaw. The standard 2.0 Ah battery will power the blower for about 60 minutes at low power. 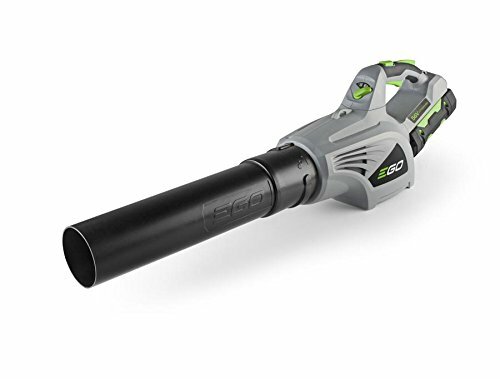 The Ego leaf blower will also work with larger capacity batteries for even longer run-times. The larger batteries are 4.0Ah, 5.0Ah or 7.5Ah Battery. Shares battery with other Ego Power+ yard tools. There are now many good options for powerful battery powered leaf blowers that eliminate the need for gas leaf blowers, electric leaf blowers with electrical power cords. With some of the choices also sharing batteries with other battery powered yard tools, there is less need for gas powered yard tools.